Fantastic sea views are to be enjoyed in this lovely 2-bedroom apartment, located in a brand new building on the sea front close to Cannes. Text chat online to our operators now to get instant discounts on your rental. Riviera Rental Guide search the French Riviera for quality holiday properties that can be rented with confidence and security. We survey the Riviera to compile comprehensive travel guides, approve all our rentals, offer online booking and include free insurance. This picturesque 3-bedroom villa set below Eze Village and just minutes from the sea is surrounded by aromatic tropical greenery and features a stunning terrace with breathtaking sea views, a luxury infinity pool and a private walkway to the quiet beach. 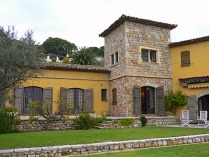 A stunning, 5-bedroom stone bastide situated just below the Old Town of Mougins with views of the Bay of Cannes. The villa features a private boules pitch, tennis court, swimming pool, garden, parking, WiFi access and many outdoor terraces. A superb, well appointed luxury villa with 4 double bedrooms with en suite bathrooms. 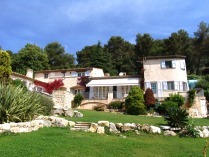 On a quiet hillside with charming views of the rolling hills, St Paul de Vence and all the way to the sea at the Isles des Lerins. This villa has a heated pool. This contemporary, 1-bed pied-à-terre is situated right in the centre of Nice and is a great base from which to explore the city. The apartment has a lovely sunny terrace and is perfect for a couple’s retreat but can also accommodate a group of 4. This charming one-bedroom apartment with a spectacular view of the sea and Cap-Ferrat is located in the Old Town of Villefranche-sur-Mer, close to the animated market square and just minutes from the beach and seaside restaurants. Lovely designer two-bedroom apartment with fabulous sea views which can be enjoyed from your own private terrace. This apartment is well located for both the beach and the city centre and is perfectly suited for either two couples or a family. Cannes you pass me a brolly?